To all who have commented, sent messages, and (hopefully!) enjoyed visiting this site over the past year, may I wish you all the very best for the festive season. Merry Christmas to you too. Thanks for the wonderful site over the last year. Long May it Continue. I check this sight every week and enjoy seeing the movements on the clyde with the great pictures. thanks for all the work you put in and Merry Christmas. R. Central Scotland. Same to you John from the wee chap and myself. Merry Christmas and a Happy New Year to your good self. Your website is easily the most informative clyde-based shipping website. Thanks for putting in the effort for all our benefit, much appreciated. Merry Christmas, and a very prosperous New Year to you too. Thoroughly enjoy the pictures, nice fresh looking website. I always enjoy the links you add, they really are of interest. 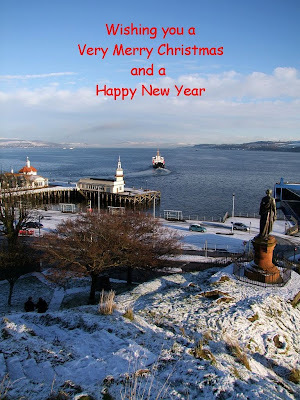 All the best from Gourock.